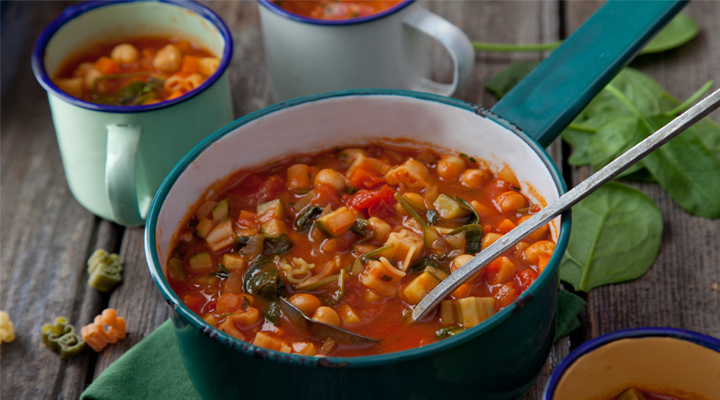 You will certainly have superheroes on your hands after this hearty, warming and nutritious soup is devoured. There’s a great selection of fun pasta shapes available now, so have fun with it. Besides supper, this would also make an ideal lunchbox filler. Heat the oil in a large sauté pan on a medium heat. Sauté the onion, carrot, celery, courgette and garlic for 4 to 5 minutes, until the vegetables are beginning to soften. Add the stock, tomatoes, chickpeas, pasta and seasoning to the soup and bring to the boil. Reduce to a simmer for about 10 minutes, until the pasta and vegetables are tender. Stir in the spinach or kale at the last minute until just wilted and remove from the heat. Serve straight away. Allow to cool completely if freezing this for another time. Replace the pasta with 2 x 400g tins of green lentils if preferred. Fry 4 slices of bacon, chopped, with the vegetables for a non-vegetarian version. Stir leftover chicken, beef or lamb in with the stock as another non-vegetarian option.